In our moment of history, it's difficult to see anything clearly -- ourselves, our lives, the world, the future, even the past. We live with a feeling of being constantly on edge, or on the edge, often straining for clarity. Respecting this state of existence, my 2016 annual edition is called Vision Quest, and it's focused on our need to go beyond clarity; my intent is to help you discover and focus a vision for your life. That's what the planets are describing, and what I am hearing. First, though, I have a short story for you, about the spiritual path we call astrology. One of the first spiritual books ever given to me was Illusions: The Adventures of a Reluctant Messiah. Written by Richard Bach while, unbeknownst to him, Jonathan Livingston Seagull was becoming an international bestseller, this book helped put a lot of people on the spiritual path -- maybe even you. Illusions is the story of an unusual man named Donald Shimoda whom Bach met while flying around the country in his antique biplane, hopping from hayfield to hayfield out in places like Kansas. This was Bach's version of a Vision Quest. Shimoda, a fellow barnstorming pilot, has a book of aphorisms containing bits of wisdom for people on the journey of self-awareness. In it is the idea that "we teach what we most need to learn." Each autumn, wherever in the world I may be, I set out on the annual edition of Planet Waves. I prepare intimate, spiritually grounded readings for you, relating to the 12 Sun signs and rising signs. Each annual comes with a collection of articles and art which I think of as being a record of the times in which we're living. Each year's readings reflect the peculiar astrology of the moment, with its special challenges and opportunities. Each is an original journey into the unknown -- something I'm now doing for the 17th time. Each of these readings is a marker in time, and all of them are available to return to. Vision Quest is the theme of the 2016 Planet Waves annual. A time-honored spiritual initiation, the vision quest tradition often involves a journey of some kind, always an inner journey though also an outer one. It's a journey with a purpose, such as returning to one's ancestral land for the first time, the experience of being left in the wilderness for days, or traveling a long distance to a meeting with a shaman or teacher. It can also include a service project like joining the Peace Corps. In the UK, the "gap year" tradition is intended as a kind of vision quest, or threshold into adulthood. Each sign of Vision Quest will include a rune reading or an artifact reading (see next illustration). 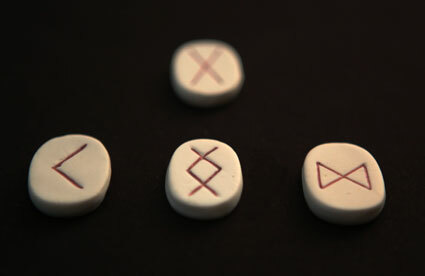 Above are traditional runes, which I have cast for this project. They provide truly innovative astrology readings, using a divination approach that allows me to get detailed and accurate readings without the natal chart. The intent of such a quest is to return with greater confidence and a new vision for yourself -- or an entirely shifted perspective on your life. My role with the 2016 annual is to use astrology to take you on such a journey, or at least guide you into one. These readings provide both an extended written interpretation for each sign and rising sign, as well as an extended audio reading. They are designed to stand up to careful review; they are some of my best work. Yet as I write and record your annual readings, I am reminded of my own need to clarify and develop my personal and creative vision. This has never felt more urgent for me than it does now, so you can be sure that your readings will venture meaningfully, and boldly, into the territory that they open up. Said another way, I am here to teach what I most need to learn. Each year I reach so deep into the planetary aspects, patterns and movements that it feels like I'm relearning astrology for the first time. Then after months of research, I distill the information carefully. I write and record readings that bring your astrology to life; that make it accessible to you; that help you see yourself, and experience your journey, more clearly. 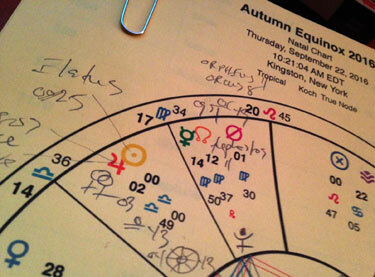 This year, as Saturn in Sagittarius makes a long square to Neptune, then to Chiron, we will be needing clarity. This astrology is all about the dissolving of established forms and beliefs. It will ask many more questions than it will answer, at least at first. Saturn square Neptune seems to be doing most of the asking; Saturn square Chiron seems to be providing suggestions for change. 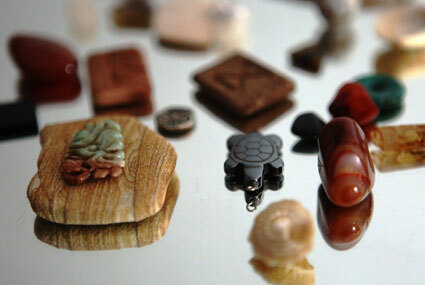 This is an example of an artifact reading, including objects I've collected in my travels since becoming an astrologer. This is the divination set retrieved from my healing cave, the Chironian, after I finished my early astrology studies there. Every sign will get a rune or an artifact reading. We are also going to experience Uranus conjunct Eris. A new factor in astrology, Eris has had very little written about it compared to many other major discoveries, yet it has so much to offer [you may download my PDF about Eris here]. I've watched the movements of Eris every day, in every chart, since we knew of it as Xena the Warrior Princess (its provisional nickname). Uranus conjunct Eris may be explosive, coming with seemingly impossible shifts in our culture -- though also in one's personal sense of self, of being, of existence. This extremely rare and potentially difficult to handle aspect extends into 2017 -- and I will provide information right up to the last event. Saturn square Neptune is about the dissolving of authoritarian and patriarchal forms. Yet we also know that something must replace them. If we don't want authority, we must take over as our own inner leader. We're also still in the aftermath of Uranus square Pluto. Did this aspect promise so much and yet deliver so little? I will look at what potential remains in what I have called the 2012-era aspect pattern, what opportunities still remain and what learning we can collect on. In addition, I use a full complement of minor planets -- asteroids, centaurs and other new discoveries, keeping the information clear and relevant. I have the privilege of a friendship with Andrew McLuhan, grandson of Marshall McLuhan, one of my favorite cultural icons (who was an English professor and philosopher). We were discussing how to present ideas for Vision Quest, and he wrote something that I must quote. The McLuhans all have a touch of the mystical to them, though I have introduced the family to astrology. "Your astrology readings are, in a real sense, timeless," Andrew said. "You don't resort to fads and trends. The value of your astrology is that it's a rock in the river. You can never step in the same river twice, but a good rock will carry you over and back every time." In this edition we are returning to the use of primal instruments. 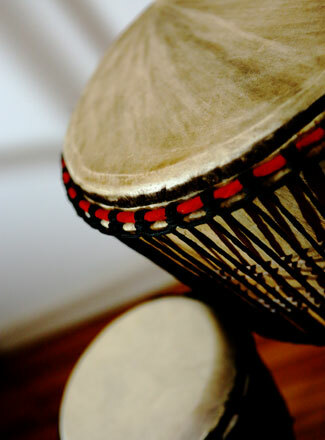 Shown above are a djembe (right) and a doumbek (left). We are also using odd instruments like mason jars along with occasional electric instruments. "I never cease to be amazed at how many times, during my birthday year, I refer back to the annual edition of my birth sign report that you offer. It is amazing to me, that no matter what time of the birthday year I refer back to it, it has something to offer. To me it has become not only an annual upcoming preview of one's year ahead, but a continual informative year-long reference guide." Ordering information for Vision Quest, the 2016 annual edition, is below, in a separate item. It explains the pricing structure, which favors those who pre-order early. I do have a request for you: we've received many comments from our readers about the amount of email we send. Part of why we have to send email is that people defer purchasing till they've been reminded several times. We are up against bulk mail blockers and people's frustration with email. In order to keep down the amount of email we have to send, I would request that you please order as soon as you know you're interested. That will be very helpful to everyone, saving much repetitive work and interruption, and you will get the best price. For those who purchase all 12 signs, I have a special gift to offer you, and mean special when I say it. I've begun Vision Quest with a kind of Sound Quest: a series of musical compositions done with my musical mentor Daniel Sternstein and his collaborator from another project, Dan Grimsland. We have been creating a series of ambient compositions, many featuring slow, primal drumming (mostly on djembe and congas), flowing, watery bass lines and sublime synthesizer pieces. Those who purchase all 12 signs will receive access to a full download of the compositions as soon as it's done. As for your readings, I expect to have them ready for you by the first week of January. Thank you for your participation in the Planet Waves annual reading tradition. Thank you for bringing your own vision quest to Planet Waves, and for joining us on our bold adventure. PS -- The best way to find out what Vision Quest has to offer is to check out the 2015 annual, which you can do at no cost, in its entirety. My personal goal is to go deeper every year, tuning into the moment as intimately as possible, never losing sight of the world around us. Here is a summary of the Planet Waves annual edition's history, which dates back to 1999. This short article will answer nearly all of your questions. We are beginning the pre-sale tonight with all 12 signs offered as a package. The reason to get all 12 signs is so you can read your Sun, Moon and rising sign, as well as those of the people you are closest to. Chart for the autumn equinox of 2016. Planet Waves readings are one of the few places anywhere you can find thoughtful, coherent information about the minor planets and asteroids. Expected delivery is the first week of January. That can change; I prefer to work well and deliver solid work. The final sale price will be $127 for all 12 signs, as soon as the readings are published. During the pre-order phase, the price will be considerably lower. Because you're one of our valued customers, we're making available to you a special offer of $77, equivalent to $6.41 per sign. This offer will last until Friday, Nov. 20. This includes all of the audio and extended written readings, the articles and artwork, and a download of the full set of musical compositions that go with Vision Quest. You may pre-order that here now. If you hold a Backstage Pass or an All-Access Pass, we will send you separately your discount product code that reflects your membership level. Please check your email for that Friday. We will send it a couple of times. This price will increase to $77 in a week and we will hold it at that price until publication; if you order before Nov. 20, you can get it for $57. 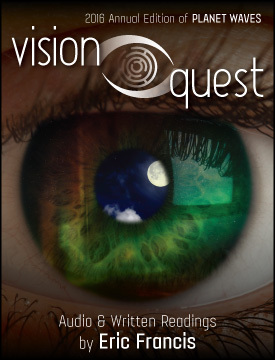 Galaxy Pass holders have Vision Quest included with their membership. Individual signs will go on sale in several weeks, beginning at $24.95 per sign. For the price of just three signs you can get all 12 -- and you will want them. Thank you for your business. Planet Waves is 100% sponsored by your memberships and reading purchases.